I’ve been wanting to make this for a long time now. But, I love my pizza sauce so much that I never want to stray away from it when I make pizza. 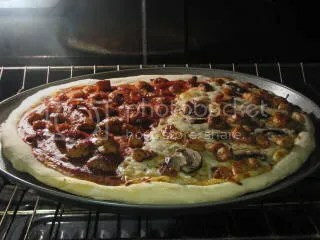 I came across this recipe on AllRecipes which combines marinara sauce and barbeque sauce. This was a great way to combine my love of pizza sauce and try the barbeque sauce, too. I meant to buy a red onion to go with the chicken but I completely forgot it. So, I used what we had on hand and tend to put on pizza anyway- sweet red peppers on my no-cheese half and mushrooms on Scott’s half. I really liked this sauce- the flavor of the barbeque sauce was good but wasn’t too overwhelming. Scott- who normally eats sausage, pepperoni, bacon (anything but chicken!) loved it and said he would like to try chicken again now. I will definitely make this again! Cook salt and peppered chicken in a skillet with olive oil over medium heat. Sprinkle with italian seasoning. Add a couple tablespoons of barbeque sauce while cooking. Mix remaining barbeque sauce and pizza sauce in a small bowl. Spread evenly over pizza crust. Sprinkle pizza cheese. Arrange chicken and any other toppings on top. Bake for 15 minutes in a preheated 45o degree oven or until cheese is melted. Sprinkle with cilantro while hot.